Brasilia, Brazil (BBN)-The Amazon River, known for its array of wildlife from pink dolphins to flesh-eating piranhas, has revealed a new treasure- a massive coral reef that stretches for some 600 miles, scientists say. 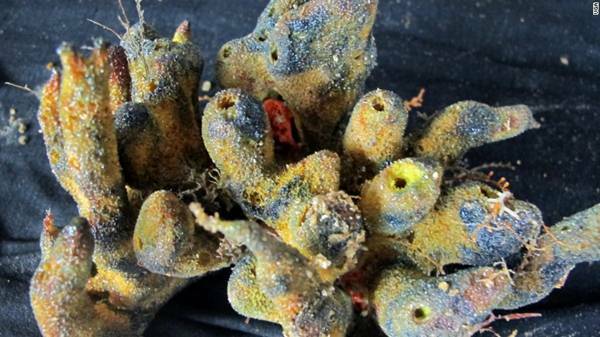 A team of scientists from Brazil and the United States discovered the reef in the muddy waters at the mouth of the Amazon, according to a report published in the journal Science on Friday, reports CNN. The reef system spans 3,600-square miles along the ocean floor, stretching from French Guiana to Brazil’s Maranhao state along the edge of South America’s continental shelf. The finding is surprising because large rivers normally create gaps in reef distribution due to unfavorable conditions such as salinity, pH and light penetration. However, this coral reef system seems to be healthy, according to the report. American and Brazilian researchers collected this sample of coral. The carbonate structure, which functions as a waterway passage for fish and other marine life, is home to a big colony of sponges and other creatures that thrive in low-light waters. The study recorded 73 reef fish species, many of them carnivorous. An international team of scientists from the University of Georgia and the Federal University of Rio de Janeiro was on an expedition to learn more about Amazon River plumes when it made the discovery. Plumes are where the river’s freshwater mixes with the ocean’s saltwater. “Our expedition into the Brazil Exclusive Economic Zone was primarily focused on sampling the mouth of the Amazon,” Patricia Yager, an associate professor with the University of Georgia and principal investigator of the project, said in a statement. The Amazon River meets the Atlantic Ocean, creating a plume where freshwater and salt water mix. However, Yager also wanted to explore the premise of a scientific article from the 1970s that mentioned a scientist capturing reef fish along the continental shelf, which suggested a coral reef may be somewhere in the area. “We brought up the most amazing and colorful animals I had ever seen on an expedition,” Yager said. The paper details the reef and the variations in its fish, sponges and other marine life along the shelf due to the amount of light in the area and the plume’s movement. The southern part of the reef, which gets more light, has a wide spectrum of reef critters. Further north, as the light diminishes, the wildlife transitions to creatures like sponges. Along with the discovery of the reef, researchers also found evidence suggesting this Amazonian jewel may already be threatened. “From ocean acidification and ocean warming to plans for offshore oil exploration right on top of these new discoveries, the whole system is at risk from human impacts,” Yager said. News of the extensive reef structure comes as various coral reef systems continue to suffer around the world because of warmer water temperatures and other factors, according to NOAA. A recent report from ARC Centre of Excellence for Coral Reef Studies showed that 90 per cent of the Great Barrier Reef off the coast of Australia is suffering from coral bleaching, which is caused by changes in ocean conditions such as temperature, light or nutrition. This bleaching happens as algae and other organisms living on the structure leave, depriving the coral of its major food source and causing it to turn white. Coral bleaching is considered “the most widespread and conspicuous impact of climate change,” according to the U.N.’s Intergovernmental Panel on Climate Change.